Facing a DUI Charge in DC provides a concise and relevant look at the entire judicial process of a DUI case. Written by an experienced attorney who focuses his practice on DUI defense, and who previously supervised the prosecution of DUI offenses, this book offers readers the guidance they need to prepare for a DUI trial. This comprehensive guide explains key topics such as the current DUI laws, the court process, the types of evidence the prosecution will use to try to convict you, and possible defenses. This book will also assist you in assessing your position, maximizing your chances of success, preparing for trial, and finally, undertaking the trial itself. Through these various topics, this book prepares readers to better establish and coordinate a case with their attorneys. 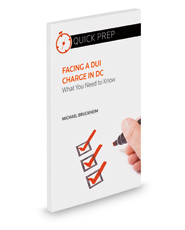 Facing a DUI Charge in DC is an indispensable resource that provides the essential information necessary to prepare for a DUI case – preparation being the key to a successful result in almost every venture. This easy-to-read book explains the proceedings from start to finish, including useful insights, warnings for the uninitiated, and tips for navigating the travails of a DUI case. After reading this guide, individuals will be able to proceed with confidence in tackling their DUI cases.